Here is how to set up radiation-free internet"
I have now tested the new adapters on my iPad mini and it works very nice. Using a charger into the adapter's lightning port allows you to have wired Ethernet while at the same time keeping your iOS device charged. That white-colored RB-Connect adapter comes very close to the ideal connection. A Power-over-Ethernet feature to charge the iPad would be great. Great developments. Ron, did you see if the Rebotnix product would allow PoE (power-over-ethernet) for concurrent charging and internet access? They provide two models of the adapter. The most expensive one has a power lightning connector so you can connect it to the "standard lightning power adapter". That is how it charges the iDevice while it is connected. Yes, but I only tested the black one. Just to clarify--does this mean that I still need the lightning to USB plug in addition to the ethernet to USB adaptor? 1. I plug the ethernet cable into a router/modem/internet source either at home or in a hotel. 2. 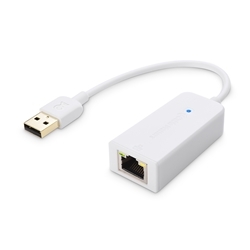 Then, plug the ethernet cable into the ethernet-to-USB adaptor shown in your previous post. 3. Then, plug the lightning-to-USB camera adaptor in with the lightning end into my iPad. Page processed in 0.1398 seconds (92% database + 8% PHP). 18 queries executed.